The 2005 movie Sahara centered around the disappearance of a Confederate ironclad at the end of the Civil War. Matthew McConnaughey’s character, Dirk Pitt, is endlessly jibed for thinking the ship could have ended up in the African desert. Although Dirk is eventually proved correct when the ship is discovered in the desert, he would have faced much less derision had he been looking for a ship in the deserts of Uzbekistan. 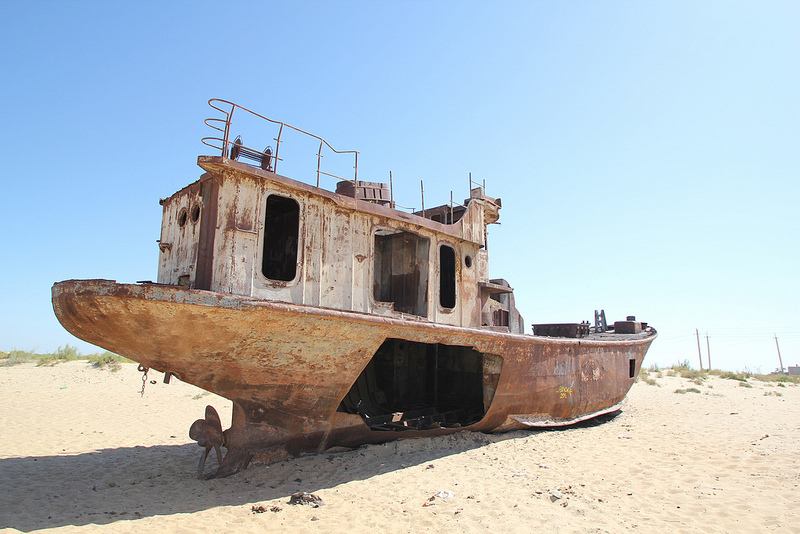 The Aral Sea, located between Uzbekistan and Kazakhstan, was once one of the largest lakes in the world. Beginning in 1918, though, Soviet central planners decided that cotton exports from the region were of vital importance and trumped all other considerations. Beginning in the 1930s, numerous irrigation canals were constructed to divert water from the rivers feeding the Aral Sea to cotton fields throughout the region. This decision devastated the ecosystem of the region, though, and the Aral Sea began to shrink in the 1960s as the irrigation canals robbed the Aral Sea of the inflows necessary to maintain its water levels. The sea had declined so much by 1987 that it split into two separate entities – the North Aral Sea located mainly in Kazakhstan and the South Aral Sea in Uzbekistan. The reduction in freshwater inflows spiked the salinity of the sea, devastating the fishing industry. Additionally, the continued receding of water levels left dozens of vessels high and dry in what has now become a desert. Fortunately for residents of Kazakhstan, Kazakh authorities have worked to refill the North Aral Sea and it is now growing. Uzbekistan, though, has chosen to continue to divert inflows to irrigation which has resulted in further desertification of the area.